AVG Automation, your Programmable Limit Switch (PLS) specialist, has now made it possible to simply obsolete electro­mechanical cam/limit switches! In spite of numerous limitations, such as cam bounce, limited life, and high maintenance, industrial use of electromechanical switches has continued due to their low cost. The M1020-PLS from AVG Automation has broken down the last barrier... the price. It offers solid-state reliability at the cost of electromechanical cam switches. The M1020-PLS consists of two parts, one being a position transducer (resolver) mounted on the machine shaft and the other a programmable unit mounted in the machine control panel. The resolver produces an analog signal proportional to the shaft position that is converted to digital format by a ratiometric converter inside the programmable unit. This position is then displayed on the front of the PLS panel and compared to the dwell setpoints programmed into it. When the process cycle reaches these setpoints, outputs are enabled or disabled, resulting in starting or stopping desired functions during the cycle. The M1020-PLS allows for quick initial setup, while matching "machine zero" to "resolver zero" or compensating for machine-wear-induced speed changes. After the resolver is mounted on the machine shaft, simply align the machine to a mechanical zero reference and enter the required offset number to read zero. The "ON/OFF" setpoints for each output can be programmed simply by the touch of a key from the front panel. The AVG Automation patented key sequence in the M1020-PLS is incredibly simple and easy to use. An additional advantage of the M1020-PLS is that you can fine-tune your limit settings while the machine is running. This increase in machine productivity pays for the PLS within months. In the "TACH" mode, the M1020-PLS displays the machine shaft speed in RPM. However, in this mode, a production rate factor can be programmed to display parts manufactured per minute. Unlike an electromechanical limit switch that requires periodic maintenance and often at places that are hard to reach, the M1020-PLS requires no maintenance and has no mechanical cams/contacts to wear out. In addition, the plug-in output relays are easily field replaceable. Once the setpoints are programmed using the front-panel-programming interface, you can detach it from the main unit, making the program inaccessible to any unauthorized personnel. 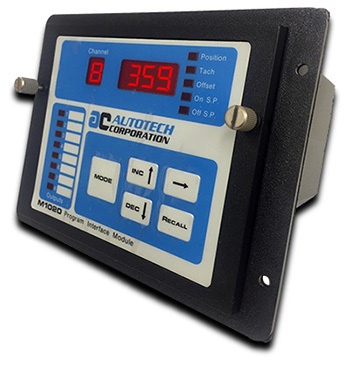 While this feature makes the M1020-PLS tamper-proof, it also saves you money by using the same programmer to program various other AVG Automation PLSs in your plant. The M1020-PLS allows another level of security against unauthorized programming changes. In addition to the detachable programmer, you need a contact closure at the back of the M1020 to enable programming. The M1020-PLS combines the ruggedness of a brushless resolver and the reliability of an advanced solid-state control. The rugged, heavy-duty, NEMA 13 (IP54)-rated resolver can be mounted on a machine shaft in hostile environments, such as mechanical shock, vibration, extreme humidity and temperature changes, oil mist, coolant sprays, solvents, etc., and the programmable control unit, M1020-PLS, can be mounted up to 2,500 ft. away in a control panel The splash-proof, oil-tight front plate permits the unit to be installed directly on the machine itself, if so required. The ratiometric converter used in the M1020-PLS assures high noise immunity and short-circuit-proof resolver wiring. Unlike some other attempts to replace cam switches with incremental encoders, and/or counter modules in a PLC, the M1020-PLS maintains one crucial feature of cam switches...it is totally absolute. The M1020-PLS will give you reliable limit settings, irrespective of power outages, machine movement during a power outage, as well as during severe electrical noise! An innovative design and AVG Automation's fully automated 100,000 sq.ft. manufacturing facility with the latest in state­of-the-art surface-mount equipment, have now made it possible to provide you with a programmable electronic cam/limit switch at the cost of electromechanical cam/limit switches. 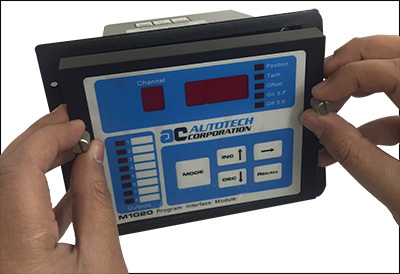 At less than $500.00 for eight cam outputs, the M1020-PLS offers all the advantages of a solid-state programmable device with the same degree of product reliability as any other AVG Autotech PLS, and yet at no penalty cost.